Codes sent to and from Execu/Tech and Comtrol's LLPTS bear no similarity to the codes sent between Comtrol's LLPTS and the 3rd party device. Execu/Tech can't tell you what they are or what they should be but your 3rd party device vendor can, because Comtrol's LLPTS uses their specs. For example, Maid Codes can come from the PBX or any device that can emulate a PBX, like DuVoice. You'll need to have your vendors decide which system will be responsible for the Maid Codes and they'll tell you which code should be used to set a room to clean. 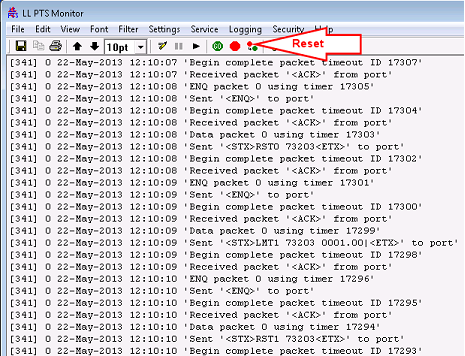 Use the LLPTS Monitor to determine if the code is being received by Comtrol's LLPTS. 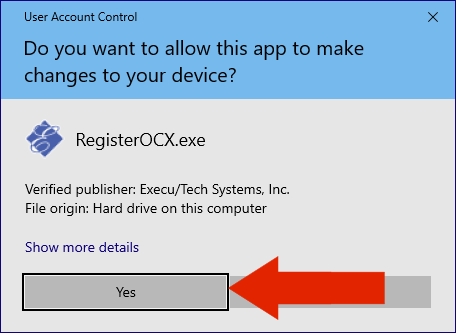 When you click the application to start it and nothing happens, it's possible that one of the dependencies, an ActiveX control, isn't properly registered with Windows. This can happen if the interface is moved to a new computer, reinstalled or the original installation didn't complete. Don't worry because we have a small utility that will do it for you. 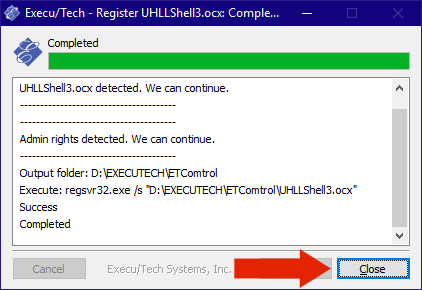 The ActiveX control mentioned above is "UHLLShell3.ocx" and is message translator between our interface application and Comtrol's LLPTS application. In the same folder where the interface application "Control.exe" is installed, you'll find "UHLLShell3.ocx". In addition to this, you'll find the utility that will register the ActiveX control and it's named "RegisterOCX.exe". Here's how you run the utility. You must be a Windows Administrator user or have the credentials of a Windows Adminstrator to run this utility. If you aren't a Windows Administrator user, you'll receive a warning message and be given the opportunity to enter credentials. Execu/Tech support does not have this information and you'll need to consult your management or IT professional. Locate the file "RegisterOCX.exe" in the same folder as the interface application. Click it to run. If you have Windows Administrator credentials you'll see this window. Click Yes. The utility will run automatically. Once it says "Completed" at the bottom, click Close. Now try running the interface application again. If this didn't solve the problem, contact Execu/Tech support and we'll help troubleshoot it. Interface file (gainpassX.fil) is in use whole opening. This error can occur when the file that contains information required by the interface application is locked by another process. This can happen if you're performing a lot of check-ins and check-outs (group check-ins and check-outs can add many records to the queue at once), if the interface is performing a resync, or if the PMS or interface application has locked up. Here's what you can do about it. If one of these steps solves the problem there's no need to perform the additional steps. Try clicking "Yes" a few times to see if this allows it to continue. Check each of your terminals to see if anyone's application has frozen or shows an error. Reboot terminals that are locked or show an error. If time permits, reboot the computer where the Comtrol Interface Manager is installed. This might be your server or it might be a separate computer. If you don't have time to reboot, you can click "No". By doing this, the room information won't be synced with your 3rd party devices like phone and entertainment systems, but this can be resynced at a later time when you aren't as busy. LLPTS is an application that runs as a service and is provided by Comtrol. It's the central point of communication for interfaces between Execu/Tech and 3rd party devices. 3rd parties (vm, PBX, Call Accounting, etc.) connect to LLPTS via TCP/IP or serial cable. Before beginning troubleshooting, you should reboot the computer running the interface.Most often the same computer runs both interface applications (comtrol.exe and LLPTS). After the reboot you can test the interface gain. If things still aren't working, you can begin with these troubleshooting steps. Verify that our side of the interface is running (COMTROL.EXE). This is usually running on the server, installed in folder similar to "ExecuTech\Comtrol" and is configured as a scheduled task. Some customers like to run it on the desktop, so if you don't see a Scheduled Task, check for the process (COMTROL.EXE) using the Task Manager. If it's running, stop it by ending the Scheduled Task, or closing it if it's running on the desktop. Even after you end the Scheduled Task, the process might continue to run because it's attempting to process any pending charges. If this remains for more than a minute, use the Task Manager to end the process (COMTROL.EXE). Run the interface manually by browsing to the install folder and double clicking it (COMTROL.EXE). The IP address of the computer running LLPTS has changed. Fix this in the settings. A firewall is preventing communication. You can see the IP address and port in the settings. The LLPTS service isn't running. Skip to the Thirt Step to verify that LLPTS is runing properly. Close the interface and restart the Scheduled Task, or if it's run at the desktop, restart it using the shortcut. Open COMTROLLOG.FIL in the Comtrol folder and scroll to the bottom and look through recent messages. If there are problems reading the file containing the checkins and checkouts or a problem communicating with the LLPTS service, you will see the errors. If everything looks ok you need to open the LLPTS Monitor and look at the logs. LLPTS can be installed anywhere and is usually installed in a location close to the phone devices for easy connection. At the start of the log you’ll find a list of the devices and the DMM. The DMM is a number that defines the device. Use this DMM to filter the log so you can see if it’s having communication problems. When you open the LLPTS Monitor, you should see the log scrolling. If it isn’t scrolling, or it has any errors try clicking the restart button. Try it a couple times if you get an error. If you keep getting errors, restart the computer because there is a problem with the service. In this sample log you see that a message was sent to DMM 341 (DuVoice) that set a restriction on a room, 73203. The timeout was begun and DuVoice responded with an < ACK > or positive acknoledgement, stating that the message was received and there were no problems with it. If there were a problem, LLPTS would have received a < NAK > or possibly nothing at all if the communication isn’t happening. If there’s no communication between LLPTS and the 3rd party device, there are a few reasons. The 3rd party device (phone, VM, etc.) is communicating using the wrong IP address / port, or are using the wrong COM port and port settings. Check these in the “Settings” of LLPTS. For TCP/IP connections, LLPTS can act as the client or server, but it acts as a server by default. The port numbers will be assigned by LLPTS but these can be changed if needed. A firewall is blocking the port. If you can't make sense of the log files, contact Execu/Tech support. Customers without a support contract may be billed for assistance.